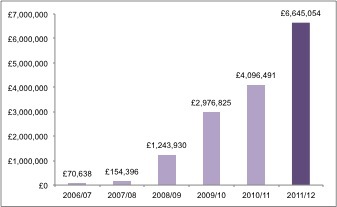 The Serious Fraud Office’s (SFO) income from successful investigations jumped by 62% last year*, from £4.1m to £6.6m. The SFO is allowed to keep some assets seized as a result of its investigations through the Treasury’s Asset Recovery Incentivisation Scheme (ARIS). David Green the Director of the SFO has indicated in the past that he would prefer for the agency to be funded direct from government rather than receive ‘income’ under the ARIS scheme. In Innospec there was acknowledgement that the ARIS scheme funding could be perceived as creating a conflict of interest in the agency. Against this backdrop the SFO Director has flagged his preference for the SFO to receive ad hoc funding from the UK Treasury when necessary for big cases. LIBOR is an example of this and we have been assured that there will be others. Ad hoc funding for the SFO is crucial as the SFO’s operating budget continues to shrink. However, last week Emily Thornberry, Shadow Home Secretary exposed the difficulty with providing the SFO with scaled back funding and requiring it to seek additional money for specific investigations. Answering the question of whether the Attorney General would give public notification of each occasion on which the Serious Fraud Office requests additional funding from the Treasury the Attorney General said it “not be possible to do this without the risk of prejudice to the success of the Office’s operations”. There are pro’s and con’s for either method of funding. However extra funding is secured, care must be taken that ad hoc funding does not leave the agency living a hand-to-mouth existence given the scale of the white collar and corporate crime challenge facing the agency against a backdrop of the damage they do UK PLC. The SFO Director has said that the SFO will never refuse to take on a case simply on grounds of cost and that to do so would be deeply damaging to public confidence and provide a perverse incentive to criminals to commit high value complex fraud. The question is how will the public ever know!? While ad-hoc funding is welcomed, SFO funding must to be consistent and sufficient to enable the SFO to plan ahead with confidence. The SFO must avoid falling into the trap of living hand to mouth and avoid repeating history where there has been an element of penny wise, pound foolish. Last year ARIS funding provided the vast bulk of the agency’s additional income, making up 95% of the SFO’s income last year, up from 69% the year before.